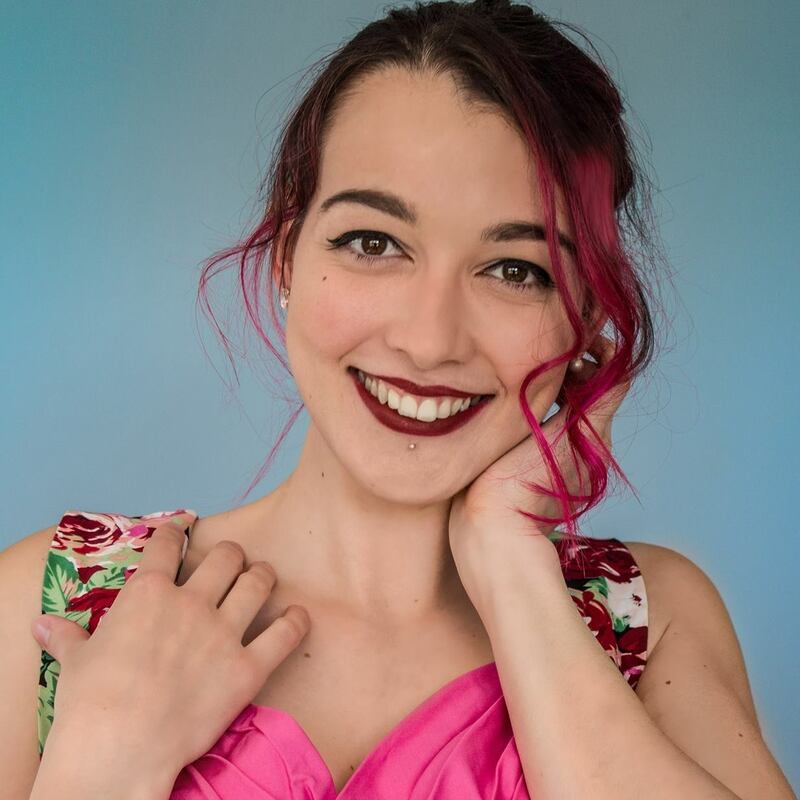 Oh Sew Quaint | Handmade Sewing Gifts and Sewing Inspiration: Pattern Review - Colette Moneta - Dark Floral Knit Dress perfect for Spring! Pattern Review - Colette Moneta - Dark Floral Knit Dress perfect for Spring! The Colette Moneta dress - your new favourite knit sewing pattern - because the best dresses have pockets! You know those first sunny days of spring where you want to leave your coat at the door but there is a still a slight chill in the air? The long-sleeved Moneta dress is the perfect thing to wear! 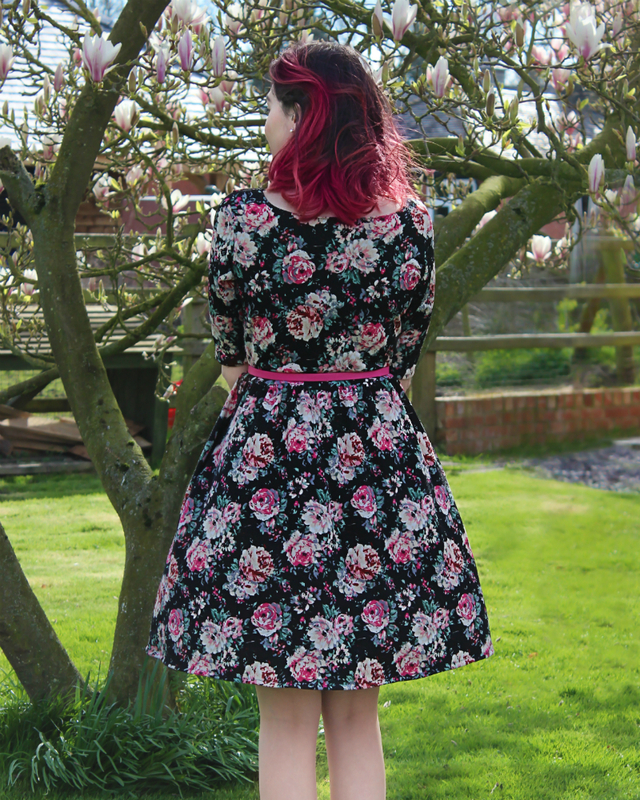 I was first inspired to make a jersey dress after seeing The Crafty Pinup's TATB Agnes Dress Hack which she also made in a black jersey with pink flowers. While it's rude to copy other people's sewing projects, I fell in love with the dress so much I just HAD to have my own. With a dress like this, you look effortlessly glam but in reality you feel like you're wearing an oversized T-shirt - so comfy! I bought 3 metres of black floral jersey from Minerva Crafts - it's fairly thick but not so thick you'd be uncomfortable in direct sunlight and it's plenty breathable. I'd had it sat on my shelf all winter prepping myself to cut into it. I'm still fairly new to jersey so I didn't want to start this project until I had some previous experience. I'd forgotten about this project until the Moneta party came along and I really wanted to join in but was too busy with my Etsy store to sew during the party competition, but a window opened up just in time for spring. A shame really, as this dress is best suited to wear from Sep-April in my opinion, but I'm sure this will be brightening up rainy summer days knowing England's luck with weather. A petticoat underneath really brings out the structure of the skirt nicely whilst still using a soft and drapey fabric. 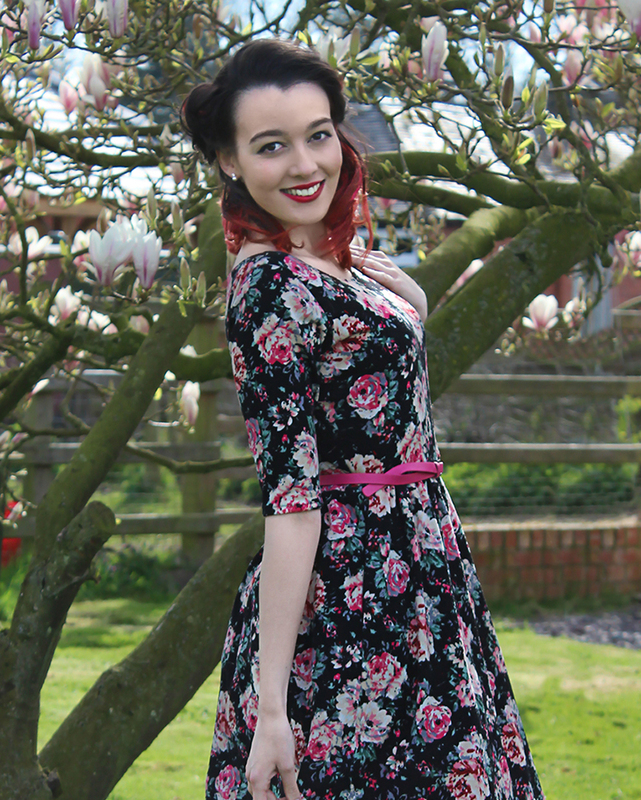 I chose the Moneta over the Agnes hack mostly because I couldn't be bothered to make any pattern adjustments! But I also prefer the neckline on the Moneta, and there are some lovely collar variations available for free on the Colette website. I had no issues with the cutting out or the sewing instructions of the garment. If anything, I was pleased with how quick and it easy it all was. The most time consuming part was gathering the skirt, and I quite enjoyed the elastic method suggested in the instructions. I didn't have any clear elastic to hand so I just used regular elastic and it's come out okay, albeit a bit bulky. I'd be keen to try clear elastic next time. I can only find one fault in this pattern and that is the sleeve/armhole situation. Myself and a few other bloggers have noticed that there is a lot of fabric in the upper arm where the sleeve meets the armhole. On this particular fabric it's not too noticeable but I'd like to figure out how to adjust it for future Moneta dresses as it's just looks a bit odd and could be quite distracting on a lighter coloured fabric. I am already planning my next Moneta and I can see this being a pattern I return to again and again. As much as I love dressing up in 50's inspired cotton fit-and-flare dresses, they aren't that comfortable to wear day-to-day. As I work from home I typically wear pyjamas all day, but I'm hoping Moneta will change that as these dresses are SO comfortable. The Moneta is simple to accessorise too, a waist belt adds a welcome pop of block colour to the busy print of the fabric. This is a sewing pattern staple. It has endless dress possibilities with it's 3 sleeve lengths, several collar variations and of course you could make it with any skirt length. I was put off the price of this pattern initially but I feel it's well worth the money as I can see several Moneta's joining my handmade wardrobe in future. Have you made a Colette Moneta dress yet? If so, how did you get on - and did you have any issues with the sleeves? 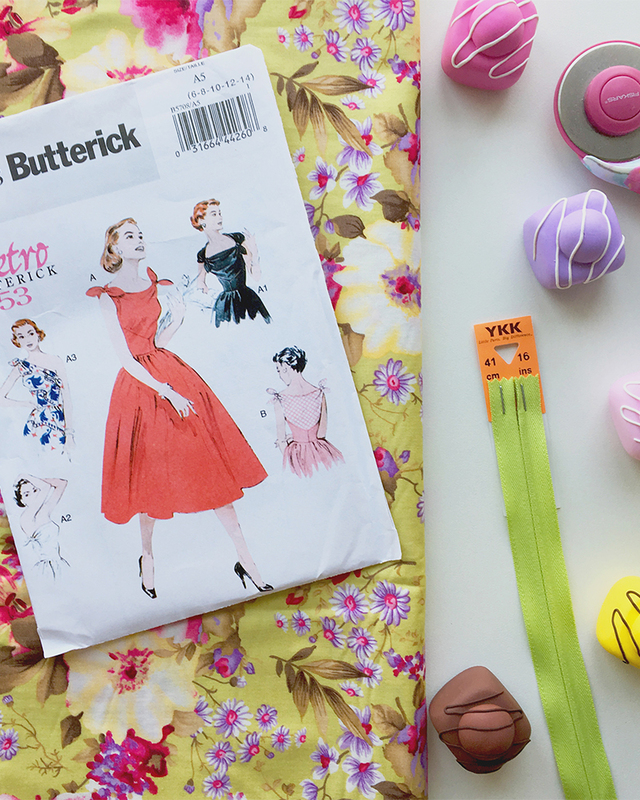 What's your favourite spring dress sewing pattern? Let's chat about it in the comments below!